here’s my latest released track. It’s a remix I did for Italian producer Miriam Macri out on Benthic Recordings. 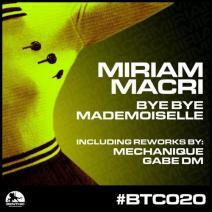 The track is called Bye Bye Mademoiselle and gives title to the Ep wich includes another original track called Hello Mademoiselle and one more remix by Mechanique (also label boss). For this remix I received the parts from the label but I used little of them, like the pad sound wich I chopped and used a loop of it and the dubby melody that comes in at 5:00 circa. I used some cricket’s noise I recorded this summer in the wood that you can hear almost through the whole song and some big fly buzz which I also record this summer while working on a live show I did in Viareggio (Tuscany). I tried to improve my mixing skill and tried to blend smoothly bass and kick drum following all the hints my friends and colleagues gave me on Subsekt.